By Rachel Held Evans, on January 02, 2012. 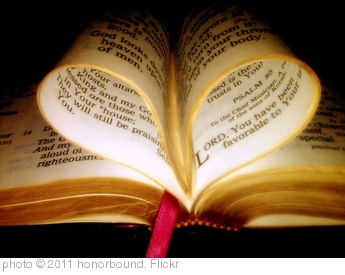 My relationship with the Bible has been a lot like that of a daughter to her parents. I’ve been through the happy, childlike dependency stage, the one where I believed the Bible was impenetrable, the stories of Adam and Eve, David and Goliath, and Joshua and the Battle of Jericho as true and as good as my mother’s scent. Then, as a young adult, I fumbled through an angry stage, one where I realized that after Joshua “fit the battle of Jericho,” God told him to kill every man, woman, and child in the city, and that coursing through some of my favorite Bible stories were the currents of genocide, xenophobia, patriarchy, and misogyny. I began to doubt what I’d been told about the Bible’s exclusive authority, inerrancy, perspicuity, and internal consistency. Like a teenager suddenly made aware of her parents’ flaws, I screamed and hollered and slammed doors. I sunk into quiet withdrawal, feeling angry and betrayed that the Bible wasn’t what I’d once believed it to be. Over the past few years, however, I’ve worked up the courage to re-approach the Bible, this time with a different set of expectations, and I get the feeling that I’m in the early stages of learning how to relate to it the way that an adult child relates to her parents, a way that honors and respects the Bible for what it is, not what I want it to be. The Bible isn’t an answer book. It isn’t a self-help book. It isn’t a science or history textbook. It isn’t even a single book – but rather an ancient collection of letters and laws, prophecies and proverbs, stories and songs, spanning thousands of years and written in languages and cultures far removed from my own. And so the question I’ve been asking lately—especially after my “year of biblical womanhood”—is how do I relate to the Bible as a grownup? How do I honor it and value it and celebrate it for what it is, not what I want it to be? So for the next several months, I’ll be dedicating most Mondays to addressing this important topic, at both an academic and personal level. We’ll discuss books (like The Bible Made Impossible by Christian Smith and Inspiration and Incarnation by Pete Enns). We’ll confront myths (that the Bible presents us with a single prescriptive formula for how to be a woman, that the Bible’s meaning is self-evident, that we can somehow read the Bible without interpreting it). We’ll tackle practical questions (how do we teach the Bible to our children? what should our “devotional” times look like? how can we go on being transformed by the Bible, even in the midst of questions and doubts?). We’ll conduct interviews and roundable discussions (three views on “inspiration,” four views on “inerrancy.”) We’ll talk about our own struggles and triumphs (passages that have changed our lives, passages that have made us doubt). And sometimes, we’ll just “sit” with the Bible (a poetic excerpt, a troubling passage, lectio divina). As I’ve said before, I believe the evangelical community is on the precipice of engaging in a difficult and honest conversation about how we relate to the Bible, a conversation that may very well divide us, but that also has the potential to be beautifully refining and redemptive. I hope that, in some small way, we can represent the best of that conversation here on the blog by engaging one another and the Bible in honest, civil, and constructive ways. So, how has your relationship with the Bible changed over the years? What, specifically, would you like to see from this series?